Thank you and thank you all for participating in today’s call. First of all, I would like to thank our co-promoters, Tom Brown, from TGB Promotions and Mike Battah and James Leija, from Leija Battah Promotions. And as well, of course, our sponsors, Corona, and our local sponsor in San Antonio, Metro PCS, who has activated this fight in over 130 stores in and around San Antonio. The biggest thank you goes to Al Haymon’s PBC and SHOWTIME Sports for their commitment, their continued commitment, and passion for the sport of boxing. It is a pleasure now to introduce to you Stephen Espinoza. Thanks for the introductions. Glad to be back in San Antonio and glad to be back with Richard working another big event. I’ll be brief here. These two fights on the televised portion can speak for themselves, two title fights in the 140-pound division. Two fighters who want fight. Obviously, our main event here, the entire card, was postponed for a period of time due to an injury, but everyone was anxious to get it rescheduled. 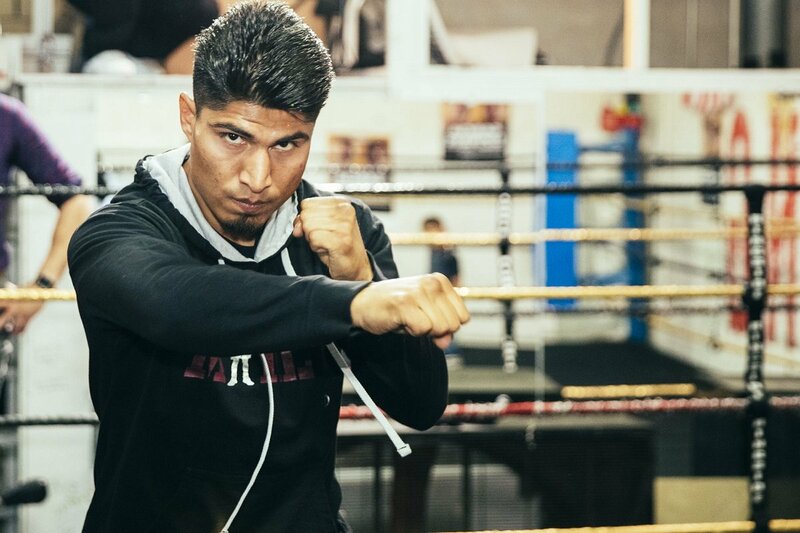 Mikey Garcia certainly wants his opportunity at the title. Sergey Lipinets was just as anxious to keep this fight on the schedule so that he could get a career- making opportunity. We look at our co-feature of Barthelemy and Relikh, a controversial fight in 2017 and each of them wasted no time wanting to get into a rematch, no one doubts that. So, we’ve got four guys in the 140-pound division, all looking at extra fights. Just a reminder, before the 10:15 SHOWTIME start, at 8:00 pm on SHO EXTREME, we have local favorite Mario Barrios and Eudy Bernardo. And then, a really solid fight, really a better than solid fight, it’s really a solid fight for an Extreme card. It’s a look at the eliminator between Alejandro Luna and Richard Commey, it’s along with all the other non-televised fights. It’s going to be a really strong night of fights. So when it comes to history, San Antonio is certainly one of the richest cities in the United States. Many battles have taken place there outside of the ring and more recently, inside the ring. San Antonio is a fight town, its fans are passionate and knowledgeable. So it’s only fitting that this historic showdown between one of the hardest hitters in the sport, a world champion, and undefeated fighter, Sergey Lipinets against one of the pound for pound best fighters in the world, a three-division world champion, an undefeated superstar, Mikey Garcia is taking place in San Antonio. I was fortunate to promote many big events there, so I’m really excited to bring this exciting card back to San Antonio. We will have an amazing 14 fights on this card. A little bit of everything in store for fight fans. Five of the fighters are from Texas, so there’s plenty of Texas flavor on the menu as well. Most notably, local San Antonio star and undefeated with a record of 20-0, Mario Barrios and 14-0, Brandon Figueroa, the brother of Omar Figueroa. Then we have as well emerging stars such as Alejandro Luna, with 22-0, one of the most exciting fighters in the sport. The co-main event, Stephen mentioned it already, features a rematch of one of the most exciting fights of last year. I checked the weather; it’s beautiful outside and it will be hot at the Freeman Coliseum. For as little as $20, you can see the most exciting card, top to bottom, that I can remember in a while. Action, excitement, and passion will be on display. I’d like to turn it over to first the trainers, and then, the fighters. Both fighters are trained by two of the best and most decorated trainers in the world. Sergey Lipinets is trained by a two-division world champion and someone who has made a big name for as a trainer now as well, having trained many world champions in his corner. It’s a pleasure now to ask Buddy to say a few words. Good afternoon. Basically, I don’t really have too much say, man. I want to thank everybody for putting the fight together. I think it’s a great fight for boxing. I think Mikey took on a big challenge, as well as we have. In boxing, the best should always fight the best. And this is a fight, that didn’t take long to make and I’m happy to be part of it. As far as anything else goes, I just have three words for everybody, that’s wait and watch. Thank you, Buddy. Well, the Garcias. The Garcias are to boxing what the Kennedys are to politics. They are today, the first family of boxing. The patriarch, Eduardo Garcia, he mentions that he’s officially retired but I can tell he is still very active every day. He’s in the gym and sharing his wisdom with young kids, very passionate about it. He’s there at every training session for Mikey, of course. So we have Eduardo, and then there is Robert Garcia, the former world champion, in 2012 BWAA Trainer of the Year. He has gyms in San Antonio, as a matter of fact, and in California. And we’ll have several of his fighters be active in San Antonio on that card. It is a pleasure now to introduce to you one of the best trainers in the world, Robert Garcia. We’re just ready. We’re obviously ready for this fight just like Buddy said it’s a big fight for both fighters. So we’re definitely taking this fight very seriously and even though it got postponed a month later, we continued our training and sparring. So we’re going to be in good shape for this fight. Now to the two undefeated fighters, both are world champions, and both look at this fight as their platform to make a statement and to make history. First up, Sergey Lipinets, is a fighter who has two passions, and in a way, these two passions go hand in hand; it’s boxing and chess. If he’s not in the gym, he plays chess and if he does not play chess, he’s in the gym. It’s pretty much as simple as that. He’s heavy-handed, he’s strong, he knows as well how to box when necessary, and he quickly became one of the most feared fighters because of his skills and his power. He comes from the Eastern European School of Boxing, born in Kazakhstan, raised in Russia, and now living in Beverly Hills. Please welcome now the undefeated IBF World Campion, Sergey Lipinets. Hello, everybody. Everything is great, everything went fine, and the hand is completely healed. I’m using it at will, no problem, full power. I’m very anxious, really want to get to San Antonio and just get in the ring. I’m just delighted, I’m just very excited about the opportunity. I believe that that’s the only way we can make a statement in boxing. Even winning the title, I still didn’t really feel like a champ because of the fact that I didn’t really fight a guy that had been on the top of the game, in the world of boxing. No offense to Mr. Kondo, it’s just that I really can’t wait until I shows my skills and prove to myself first and then, everybody else, that I belong at the top of the food chain. Now, Mikey Garcia. Mikey Garcia in my books, and in the books of many, is today, pound for pound the best fighter in the world. In my opinion, it’s not about what he’s done, in one, or two, or three fights, but it is his cumulative achievements with 37 wins and zero losses. The fact that he has already – he’s already a three-division world champion, and the fact the he continues to challenge himself to fight the best and most dangerous opponents. He stands up for what is right and what is wrong. He’s very much involved in charitable causes and he is a mentor to many young fighters. All this together makes him, in my books, pound for pound. And today, he’s an ambassador of the sport of boxing. I am very proud to be on his journey and it is a distinct pleasure now to introduce to you the undefeated superstar, Mikey Garcia. I’m very happy with training camp, very excited for the upcoming fight. We’re only less than two weeks to go now and camp went great even though it was pushed back a few weeks. It didn’t really affect us at all, like my brother told you, we continue to train, we continue our sparring and we peak every moment, we work hard, we have great sparring partners for this match as well. So I couldn’t be happier. I’m very excited to be in San Antonio. I know that it’s a big boxing community. My brother has a gym out there and so, we have a big, strong fan base in San Antonio. In general, to be in Texas is great. I won a world title there back in 2013 and now I get the opportunity to win another world title in the state of Texas. So I’m very excited for that as well. I can’t take Lipinets lightly at all. I know he’s a tough, determined champion and he sees this as a huge priority in turn. When he faces me, if he were to beat me, I’ll start delivering for him. But I’m not looking at that, I’m focusing on winning. I believe my skills and my boxing abilities are greater than what he brings and I’m just excited for the fight. I’m ready to get on and I think this will open up even bigger doors for me. So it’s going to be huge accomplishment when I do win this world title on the 10th and I think it’ll be a big celebration for our family, my dad, my brother, for my nephew. For the whole family to be champions in anther division. It’s going to be a great night. I just can’t explain how happy I am. It’s just a great opportunity, a great position that I’m at and I’m just very thankful to be where I am. How much of a factor in this fight do you think your professional experience will be compared to him? I don’t think the experience is the difference here. I think he has a lot of experience like you just mentioned as an amateur. Even moving up the ranks as a pro, to be champion in only 13 fights, tells you the caliber of fighter that he is. It took me 30 fights to get a title and it only took him 13. So, it definitely tells you he’s champion material and experienced enough to be there. I think the deciding factor and what’s going to allow me to do prevail is my boxing abilities, my speed, my footwork, my timing. The skills that I possess, I think are greater and that’s just going to help me win my fight. Are you ready to say that you’re done at 135 pounds? No, I am not done at 135 and unless you guys just don’t, include the entire quote, when I do mention, moving up to 147, I always mention that I do want to come back to 135 after this fight with Lipinets. I want to come down to 135 and even unify the titles there before officially leaving the division. But the plan is to fight this fight first, take care of business on the 10th, then I will look at my options. But I do want to do a unification match at a lightweight. Then eventually, make my way up to 147. Maybe even by the end of this year, I’ll set it, maybe by the end of this year. If not, then next year for sure. That’s a rich division with huge names, huge fights, that I want to be part of. Richard, do you think could tell me your thoughts about Mikey’s game plan about beyond March 10? First of all to have a fighter who can be dominant or who is dominant in two weight classes, once he moves in 147, I have no doubt that he will dominant there as well. I think it’s exactly what I said before in the opening remarks, that is what somebody who is pound for pound on the top of the list. If the Linares and Lomachenko fights don’t happen, there are other options at 135 for Mikey, such as Robert Easter. So, he has a lot of options at 135, he has a lot of options at 140 as well, including potentially the winner of the other fight which is going to be the co-main. First things first, and I think this is exactly dangerous when you start overlooking opponents because – and I had that same conversation with Mikey not to overlook Sergey and I know he doesn’t.. We may have that same conversation about Sergey then, after the final bell on March the 10th. So, I think there are definitely, for both fighters, big options out there. What are Sergey’s thoughts about all the plans that are sort of out there that Mikey could be involved in beyond this fight? Well, first of all, the fact that everybody’s talking about Mikey or fighting this guy after that fight or that guy after that fight, it really doesn’t matter with me. If anything, it motivates me even more as far as looking for some other fights after that fight, I’m not looking past Mikey. There’s nothing that I’m thinking about but Mikey’s fight and then when the fight actually occurs and when I come out to where I’m going to come out of that ring, then you start talking about the future opponents. Of course, you want to the fight the best. I’ve proven my whole career as a boxer, I’ve fought always tougher guys than people thought I should have been fighting. I was not built up on their buddies, I was not built up on thinking that we’re supposed to be opponents. So, yes, I’m looking for a challenge all the time. But first things first. On March 10th, Mikey Garcia. Sergey how much better do your hand feels at this point, less than two weeks before the fight? It’s better than ever. It’s like a brand new hand. It’s way better than it was before. You will see my hand in action guaranteed March 10th; not once, but many, many times. In hindsight are you happy that it was supposed because now you’re going into the fight healthy as opposed to before? Of course I was upset, of course I was distracted. But in hindsight, everything happens for a reason. I’ve been very philosophical about it and then look, it’s just whatever happens, happens. You got little more time. As a matter of fact, it even works for the best. So I’m great now, that’s the main thing. Mikey I was just wondering what you thought of Lipinets’ last performance? Well from what I’ve seen, he did fight a very durable guy and that’s why he did go the distance but I also saw another side of Lipinets. He also can box. He can use defense. He can time and counter. So there’s some more to Lipinets than just the power. There’s more than just that right hand. So those are things I have to be aware of, I have to be cautious about. That’s why he is a world champion so I respect him, I give him the credit for being champion with only 13 fights and taking on a fight against me shows his heart and determination. Did think he was capable of doing those things and did he surprise you a little bit? Well I hadn’t seen that. I had seen his fight against Zappavingna a year ago and this time around he fought a little differently for some of the rounds so I was a little surprised that he could box the way he did. He is more than what people paint him to be and that’s why he is a champion. Buddy, what are you hoping that Sergey shows people in this fight because I know you think very highly of his capabilities and what he can do. It’s not about what I want I him to show. I know what he’s going to do. It’s just a matter of time. And like I say, my favorite three words for this fight are: wait and watch. That’s all I’m going to say. So no matter what you ask me, that’s the answer you’re going to get from me is wait and watch. What was it during training camp at the beginning when the fight was scheduled for February 10, what was it that you saw that was the concern and what kind of confidence does that give you for your hand going into this fight? Well, main reason for concern was of course the fight is going to get completely scratched out. That was the main reason I was real upset. I knew that I wouldn’t be able to use that hand at a full capacity the way it was. And as a matter of fact, you have to go to the Athletic Commission appointed doctor to take a look at it and he was the one saying that you can’t fight, you have to lay up for a month to let that hand rest. Now the hand is great. I’m using it every single day. I’m hitting as hard as I can, there’s no problem with it and I’m happy. That’s it. I mean there is nothing to be even worried about. What are you thinking about for March 10 with Sergey Lipinets as far as what kind of hunger and drive does that give you to make sure that you can, after the fight is done, we can talk about those type of things that we were talking about earlier? Like I’ve always said, we have to plan out for the future, and plan for the best but, first things first, March 10, I have a very important fight with Sergey Lipinets. That’s why even though we do mention other future plans, my main focus has been Sergey Lipinets. I think with his type of fighting and style and his hunger to be who I am he said it before, he wants to be what I am, he wants to be in my place. That’s a recipe for a great fight. He’s going to come in the best shape ever because he knows what’s in front of him. He knows the opportunity that’s in front. I’m coming with everything because I also want that title. I want to gain that other fourth division title for me. So that’s just a recipe for a great matchup and I think he’s going to give everything he has and leave everything in the ring and I’m going to do the same because that’s who I am. You’ve seen me, many, many times and that’s just what I do. So I think it’s going to be a great match. I think I’m going to win because of my boxing abilities. Like I said, my timing, my speed, my footwork, all the little elements I think are going to help me win this fight, but it’s definitely going to be a great matchup. Mikey is there a weight class that would you say best suits you or is it just going to be about looking for the biggest fights and you can make all three just as easy? I think right now as of right now the best ideal weight for me is still the lightweight division. It’s probably where I should be fighting. But I’m just taking on bigger challenges and that’s why we’re taking on Sergey Lipinets. I got a good feel for the division at 140 pounds when I fought Adrien Broner last summer. I felt good, I felt comfortable in that weight class and that’s why we’re taking on Lipinets this time. So I still feel comfortable enough to fight at junior welterweight. Sergey is a strong natural 140-pounder but I feel comfortable enough being here. Actually, I feel stronger. I don’t know, maybe the guys are bigger guys and that’s why they can take a bigger punch. Lightweight, they’re a little smaller, maybe I can hurt them a little more. But I’m open to fighting anybody that presents a challenge and Sergey definitely does that right now and that’s why we took this fight. Sergey with the hand injury in training after you fought in November, do you think it’s better that you’re fighting four months out instead of three months out? Yes, I was ready to go on February 10. I wanted to go but whatever happened, happened. And that’s going give me a little more time to recoup. The fight with Kondo was a real tough fight but it was tougher on Mr. Kondo having taken all those punches that not that many people could’ve taken from myself. I was happy to just go 12 rounds and show sides of me. Mr. Kondo turned out to be not as easy a fighter as people thought he would be. I’m happy to go 12 rounds and then get that experience. Mikey are you aware of the the risk and what’s really at stake for you if you were to lose this fight against Sergey Lipinets? I understand the risk and I understand what’s at stake, what the cost would be if I were to be beaten by Lipinets, all my future plans would be tossed out the window and I wouldn’t be able to do anything that I plan on doing in my future. But that’s why I take this fight very seriously. I took the other camp very serious, I worked very hard for all the days that we did and never took a break. I’m very focused and determined on winning this fight because this fight will open the doors that I’m talking about. A bigger fight, a bigger plan and that’s why I have to take Sergey Lipinets extremely seriously. I can’t overlook him at all. Do you have a sense of how surprising that was, for you to dominate Broner, in the boxing community? Well like I said, people still haven’t seen the best out of me. I keep telling people, the best is yet to come for a reason. I need the right opponent to challenge me, to push me to the limit so they can bring out the best out of me. When I was fighting Adrien Broner I told everybody that I would box and make the fight easy for me. Not a lot of people believed that because they just haven’t seen that side of me or they haven’t seen it in Broner. That’s why with this fight with Lipinets I get to release all my skills. Like I said, I seen in the last fight, he can also box. He can also counter. He has timing and that’s what makes him a complete world champion. I got to be able to fight these challenges so I can bring out the best out of me. That’s why I’m prepared to do everything it takes to win this fight on March 10. How important is it to you to to keep succeeding from the standpoint of the Mexican boxing landscape right now? Well I think there’s great history with Mexican fighters and just to be accepted, by the Mexican fans, as one of their own, because my parents were born in Mexico, I speak the language, I represent Mexico. I’m Mexican, born here in the United States but with Mexican heritage and Mexican blood. To be accepted is great. I’m just doing what I got to do inside the ring to give glory to my family first and hopefully my people that follow me as well. I think we’re on the right path that Mexico will be very, very proud, all my fans in Mexico will be very proud of my accomplishments. They can point a finger and say that’s one of ours, he’s our fighter and that’ll be just another huge accomplishment in my career. Is there a tendency for you, or maybe a desire to possibly fight more toe to toe in this fight? Or are you going to box completely if you have to box? Look I never go into a fight with one game plan and one game plan only. I am prepared to do whatever it takes to win my fight. If I box my way through a decision victory, if that’s what it takes, that’s what it takes. If I have to brawl with my opponent, I’m prepared to do that. If I have to put the pressure on my opponent and exchange punches in order to land a punch and try to go for a knock out, then I’m prepared to do that as well. So I’m ready to do whatever it takes. I just know that it’s going to be a great fight and I know that the fans are going to be very happy with my performance. Can you express how motivated you are as a result of reading about yourself as the underdog? Well I understand why it is all about Mikey. I realize the fact that I just stepped into the boxing world, what, 2-1/2 years ago. I understand what Mikey brings to the table and what he does as far as the publicity, as far as the heritage and as far as the boxing abilities. Of course more people know who Mikey is than they know who I am. I’m cool with that. I don’t care if people think that Mikey is going to beat me, if Mikey is going to completely wipe me out. People think what people think. Every boxing person that really understands boxing will understand what kind of a fight it is and what I bring to boxing. It’s a great challenge I’m all about challenge. They’re two great fighters that are going to fight each other. That’s the way I look at that. Okay thank you everybody. As Buddy McGirt was saying, wait and watch. Well the wait is almost over, a couple weeks left so I say come and watch. Come and watch at the Freeman Coliseum for as little as $20, March 10. Fourteen fights including two world championship fights, including one of the best fighters in the world going to challenge himself for a fourth weight class. If you can’t make it to the Freeman Coliseum in San Antonio, make sure you watch it at SHOWTIME. Thank you very much and we’ll see you all ringside on March 10 in San Antonio. Next boxing news: Gerald McClellan vs. James Toney: Who would have won this epic?